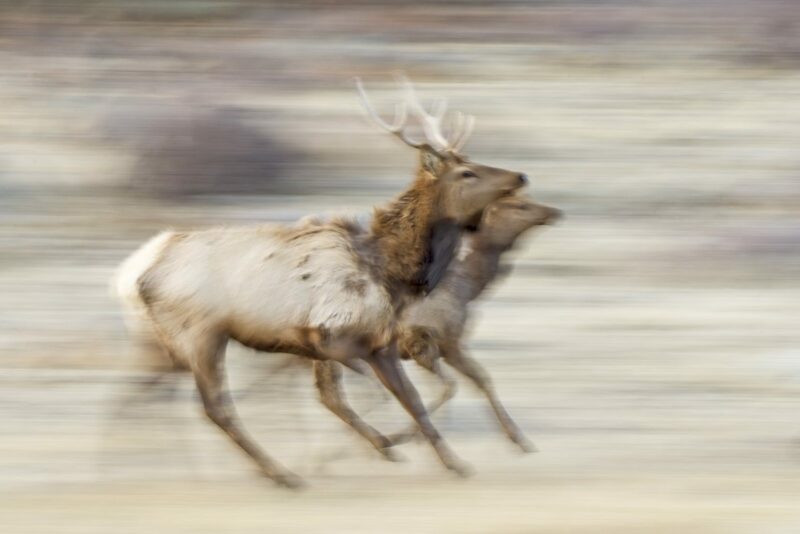 A pair of young elk—maybe a future mated pair or siblings—were trying to keep up with the larger herd. During the fall rut, the elk move around a lot and this particular herd had a large bull that liked to keep the cows on the move. This spike bull and a young cow were left behind as they kept their attention to eating, being too young to participate in the rut. Young bulls, such as this spike, are also chased off from the larger herd by the big bulls but young spikes still like staying close to their mom. The low light of early evening gave me a perfect opportunity to change my settings to capture a panning shot of the elk by using a slow shutter and wider aperture.